One must not miss the opportunity to talk about one’s own by expressing both pride and praise because it is just proper, right and good. Triple O as he is known to his fans by reason of the fact that all his names start with O signifying original, one and only with individuality, genius, ability and intellect is the gospel artiste son of my “sister”, strictly my closest first cousin but relationships make for associations closer than that kind of formality; he is essentially my nephew. He specialises in a genre called Gospel Grime - a blend of hip-hop and rap music with strong gospel inspired lyrics to which for generational reasons on my part requires I listen with subtitles but it is growing on me and I am getting better attuned to it, certain musical forms are acquired tastes over time. Performing for the past 8 or so years, he has a YouTube Channel of his music and more concerning his activities where you can get a general idea and good feel of his music. He released his album Flatline on the 11th of July 2011 and it is available on iTunes and Amazon – where you can sample tracks on the album and you should not forget to buy the album too. Thank you. 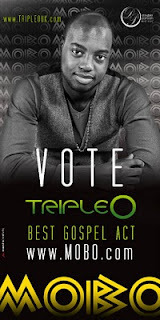 For the album, he has received deserved recognition and has been nominated for the MOBO Awards – Best Gospel Act 2011- and what is required to come tops is to vote for Triple O on the MOBO Awards Best Gospel Act page, this requires a simple registration exercise before voting, and here you can listen to the radio advert for his MOBO nomination. I am exceedingly proud of my nephew and after listening to his music I am sure you need no further persuasion to cast your vote for his nomination towards winning the prize. Vote on the MOBO Awards Best Gospel Act page – Thank you.